Beneath all the countless layers of jam bands in the San Francisco bay area and tucked away in the hills of the San Jose and Santa Cruz mountains lies a group not only trying to build a loyal fan base but also working hard for respect in the industry. The guys in Corduroy Jim are no different than acts we have seen out there and represent a large percentage of groups just trying to make their mark in the world; artists who want recognition for their passion and performers who see the music as the vehicle for their success. For the last ten years, Corduroy Jim has been playing hundreds of shows, writing their own material and running with a core group of bands that seem to play the same festivals, help one another build that steady following and sit in with each other onstage. With a blend of influences wrapped around their sound, the guys seem to have a mystique about them; something that draws you in and makes listeners appreciate their message. On lead vocals and acoustic guitar is Marty Rodriguez whose vision and energy have been driving the band since its inception. Marty has a powerful voice, a wide range and he is able to belt out those high notes with ease. On vocals and electric guitar is Richard "Richie" Thomas who is not only schooled in recording and producing but also can shred with his instrument. His phrasing flows well and is easy to follow along with. On percussion and bringing that crazy element to the show is Raymond St. Martin who knows how to fill in the gaps eloquently. On keyboards and vocals is Nick Chargin who has been playing music since the age of five, starting out on piano and later picking up guitar in his teens. He has spent the better part of his life writing, playing and recording original music with multiple San Jose bands including The BlissNinnies, Elephino, Swing Party and Shady Groove as well as playing stints with musical legends Zigaboo Modaliste of the Funky Meters and Ike Willis (a 15-year veteran of Frank Zappa's band). On bass is Steve "Bear" Strom who is consistently in the pocket and an integral part of the rhythm section. Besides playing with the guys in Corduroy Jim, Steve’s other bands include The Silicon Valley Houserockers, Latin Funk Express, Monkey Knife Fight V, Severe Pleasure, and at times he gets to sit in with the Blind Pilots. On drums is Michael Palladino who is a strong player and an amazing listener with great chops. He brings a very soulful presence to the band, not overpowering but just the right touch. Michael has performed throughout the Bay Area for over twenty years in many different capacities. He has done everything from touring Italy with the Symphony to musical theater at San Jose Center of the Performing Arts. His drumming has been his primary muse however, performing with such bands as Corduroy Jim, Mescalito, Soup, Grampas Chili, Tricycle Side Project, Blissninnies, Trouble Brothers and the Houserockers. He has performed with various musicians including Ike Willis from Frank Zappa's epic band the Mothers of Invention. The music of Corduroy Jim is enjoyable and fun to listen to. Their live performance is upbeat, moving and complex with improvised sections, catchy lyrics and danceable grooves. The song Pick or Choose puts me in a good mood when I listen to it. Maybe because it drives hard, has that free flowing Jesse Colin Young vibe to it and contains all the elements of a great song: an interesting introduction, eloquent vocals, a hard hitting bridge and soaring solo’s. Split the Sky is another driving track but more ‘Pop Rock’ based like U2 or REM. The guys stretch out a little in the middle section and then come swinging back into the song unable to stay away from the passionate vocals that complete the story. On a Friday night in September, I caught up with Marty and the band at The Crepe Place in Santa Cruz California; a small, local venue that is becoming a stomping ground for up and coming bands. I’ve know Corduroy Jim through the bay area music scene that I have been around but never sat down to find out the story behind the music. I found that Corduroy Jim deserves to be heard and needed a visit from Jambandfriendly.com! The whole purpose here is to find out for those people who don’t know your band what the sound is? What can people expect to hear tonight? Tonight we’ll play two sets: the first will feature a lot of our material that is geared towards the singer songwriter genre and to keep the flow and energy going. The second set will feature material that is geared towards opening up the envelope, or jamming in a sense, stretching it out. This is our first gig tonight as Corduroy Jim since May; all of us took a break off for the summer. We are excited to get this thing back in gear. Everyone in the band is a full-fledged musician, we all come from very different backgrounds but all have run into the same influences over the years. The sound that I try to associate with our band when someone asks is american soul rock. Some would say Americana; some would say rock, or jam rock. We represent a good portion of Americana and all the bands that have been playing for the last forty to fifty years. Some of my influences go all the way back to super acoustic rootsy blues. Nick our keyboardist is the soul man of the band. All of us have a lot of soul in the sound, and our description fits well. Maybe Americana meets Led Zeppelin, at a peyote meeting! Speaking of Peyote, I was on your website today and found out about the early days of the band. I saw that the first incarnation of the group was called Mescalito. Tell us how that name came about and the early days of that time? That was back in ninety-nine, I had been doing a bunch of writing on my own and had decided that I wanted to write a full length album. That had always been a dream of mine. I was totally focused on getting that done, went out and recruited my friends who I thought were the best musicians and had the best fit for what I had in mind. I came up with the name Mescalito from all the books I had read by Carlos Castaneda. The word "mescalito" literally means teacher, protector, one who shows you the right way to live. Thus, the title of that first album In The Desert Of Devotion refers to the total commitment and surrender to love in all the right ways. All the players of Mescalito were all friends and we had all played together in some sort of situation. But we had not been in the same room together as a unit to play. So that was new and exciting, I brought the songs to the table, had Michael Palladino on drums, Josh Baker on the bass, Nick Langston on guitar and Rich Thomas who came into the fold. Rich is from the school of recording and production. I said “I want to record an album, I got the boys together are you in?’” And he immediately said, “absolutely”. So he started to come to rehearsals to listen and slowly began to play with us. A couple months later we were ready to go into the studio and cranked out the songs in the format of a live recording using eight track. We captured the majority of the nine songs and we finished the overdubs on our own with a sixteen track. It was so exciting and scary at the same time because I had no idea of what we were doing. Thank god Rich was there to steer the ship to get us to the place where it needed to go. It was a good beginning for us because it was very organic; everyone in the band was hungry and ready. We had a lot of magic going on during those recordings. In those days it was obvious that you were connected to many of the bay area bands. Who were some of those bands and who were you running with? Oh yeah, the brotherhood bands and the Vibe Tribe: The Blissninnies, The Soup, Old Dead Bug, George Hagerty, all locally. Andy Mazilli was playing a lot, Power Surge. They were all actually playing and ones we were involved with. The song “Blues For TG” resonated most for me, is that something you wrote and where did it come from? It was the song that I could listen to over and over again. That was inspired by a very famous old school skateboarder turned musician named Tommy Guerero who oddly enough was one of my youngest brothers’ idols as a skater. And so through the years as my brother moved up in the ranks of the skating world, he also became a rock star. My brother got into music as well, introduced me to Tommy’s music and we became huge fans of his music. With that being said, Tommy’s music seeped into my sub conscience. I had never written an instrumental per se. One day I just got inspired to write this song and all I could hear was Tommy Guerero. That’s where it came from. On the song Come Around, I hear a lot Lou Reed in the beginning and actually Green Day, I am curious if there was any thought in either of those sounds when writing the song? Well, definitely Lou Reed and a lot of The Who. I was listening to a lot of it at the time and it’s funny because it can be considered two songs: the first part in the verse being very straight-ahead like “Sweet Jane” power rock. And the chorus has a little psychedelic middle-eastern feel with the jam in the middle and it all comes back to the point it started. It’s really hard to nail down, but those are some good references right there. What is Corduroy Jim shooting for, what are your goals. What kind of band does it want to be, do you want to tour and put in the miles? Or do you guys want to concentrate on the bay area locally first? I think without speaking for anyone else, over the last several years we have been focusing on building our audience here. Because I think if you just go tour aimlessly without really having a goal in mind it almost seems pointless. I have been of the mind that without getting too far ahead of myself and there are five other guys in the band that have to be on the same page. We have worked towards where we are right now which is building up our local audience and fan base. For all intensive purposes, absolutely a tour at some point is in order. Whether it starts with baby steps up north or going down south, we’ll see how we do and branch out little by little. I think if we were able to get enough resources together to do an extended tour, it’s definitely a possibility. Also, the festival circuit would be great. We should probably ask Nick because he’s the one with the most touring under his belt. (From across the table Nick responds in a cynical but mature manner)…Frank Zappa put it best, “Touring can make you crazy”. I agree with Marty, having three different types of tours you can do that are little quick ones would be best. You can cover a lot of ground and just hit the northwest, the southwest and then Colorado. Cover a lot of ground in just a week and a half so long as it’s put together well with booking. I am curious in this day and age with new multi-media and social marketing channels, is it really easier, or is building a following the same? There are more ways to get your music out there and that’s been the goal. If we can use the resources available media wise, maybe we don’t have to get on the road and physically tour as much. We could figure out a way to get some interest with the tools we have and then build an audience which we could leverage from the media. We have been loosely talking amongst ourselves about recording some new material and gearing a couple songs towards radio play. Because we need to get heard on the airwaves; if we can get even a little attention it will go a long way. Maybe we can turn that into record sales or getting people in the door to see us and further the interest in our band. You need to have an anchor show, like going to Colorado and booking two shows around that anchor show. Play in a couple bars, maybe a party and then your big show. So any kind of festival would be great for us too. What about after tonight, what’s on the books in the next few months. Actually, next Friday Rich and I are performing at Don Quixotes in Felton with a couple of friends of ours: Tom McQuillen and Jonathan “Skippy” Sherred who both play in Medicine Road. We’ll be doing our acoustic thing called Sweet Babba Jane and it is more of a traditional style to music doing covers and originals. We also have a couple shows locally in Santa Clara and then at the Brookdale Lodge with the Blissninnies. It’s their twenty year anniversary so it will be Corduroy Jim, Grandpa’s Chilli and the Blissninnies. I will definitely be there. 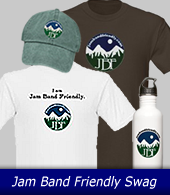 I thank you all for your time, Jambandfriendly.com supports you guys. Good luck, have a great rest of the year.